Lindy Klim and Adam Ellis welcomed baby Goldie late last year, creating a big, beautiful blended family. 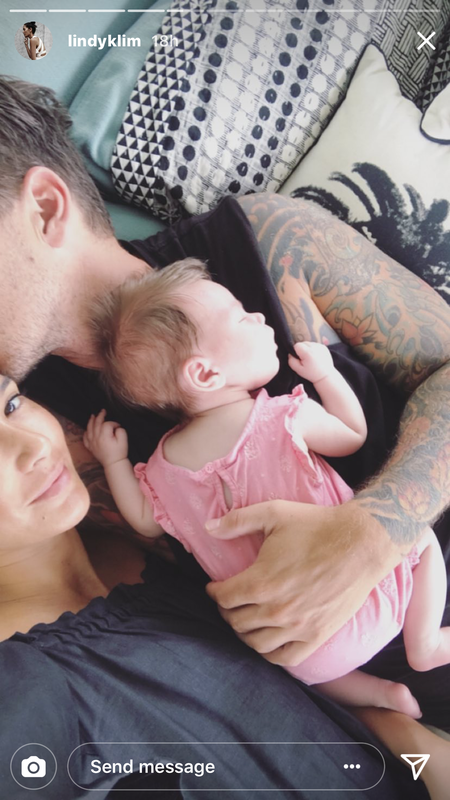 Over the weekend Lindy revealed the co-parenting switch of older children Stella, Rocco and Frankie (to ex-husband and former Olympic swimmer Michael Klim) breaks her heart a tiny little bit. Anyone who has shared custody of their kids with an ex-partner knows exactly how Lindy feels, as she waves her kids off. There’s the relief that things are a little less demanding, for a short period, at least. But there’s also the sadness of being apart – and the worry that goes along with being out of reach. It’s bittersweet to say the least and this post captures the separation struggle. It’s obvious that Lindy is not taking what looks like a pretty charmed life for granted, but that said it can be painful to separate new siblings, and shift a cosy family of six back to a more streamlined three (albeit temporarily). Lindy’s post struck a chord with other parents, who were relieved to get the chance to chat about these goodbyes and tricky separations. “I totally know the feeling. It’s hard but having one there with you makes it easier,” one Instagram follower wrote. “Thank you for sharing your truth about having to share your children with their dad. Blended families are common, but there’s not much on social media about what it’s like to be part of one. I feel you! !” someone else commented. “The blended family – I do it, feel it, understand it. Doesn’t make it easy of course, another said. Others pointed out how lucky Lindy was to have an ex who was cooperative and wanted to see his kids. But this is not luck at all, but rather how things should be! Much better to point out that some families struggle with issues surrounding the custody of children after separation or divorce – and possibly need support to mediate through their conflict. Lindy and Michael seem to be working together to do what’s best for their kids and it’s interesting to see how blending children and new partners works for them. It’s not just blended family feelings that Lindy’s been sharing on her Instagram. She’s been candidly tracking first-time-dad Adam’s journey into parenthood – via Instagram stories – revealing she’s very, very lucky to get any hands on time with Goldie. Because Adam is throughly besotted and won’t hand the baby back! Lindy and Adam got engaged in October 2016 and were expecting Goldie by March 2017. Miniature Adam looks very adorable, from where we’re standing!